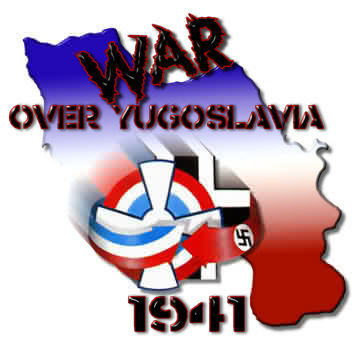 At the time of the German invasion on 6 April 1941, the Jugoslovensko Kraljjevsko Ratno Vazduhoplovstvo (JKRV - Royal Yugoslavian Air Force) flew a wide assortment and rather unique combination of aircraft. They flew among others the bombers Blenheims, Do17Ks and S.79s. Among the fighter they flew both the Bf109s and Hurricanes. The Fighter Force also used obsolete Hawker Furies, which equipped the 5th (Fighter) Puk (approx. Wing). On the morning of April 6th 1941. only eight IK-2 and six IK-3 were in flying condition. The 107. squadron, wholly equipped with IK-2s situated on Bosanski Aleksandrovac airfield near Banja Luka and 161. /162. squadrons each had three flyable IK-3 on Zemun/ Belgrade airport. Third patrol consisted of 2nd.Lt. Dusan Borcic and Sgt.Eduard Banfic . On the approach of first 234 Luftwaffe bombers (O7,OO) mostly Junkers JU-87s from I/St.G.2 and III St.G.3, Dornier Do-17 Z-2s, from I/K.G. 2, II/K.G.2, 111/K.G.2 and I/K.G.3 with Heinkel HE-111 Hs of II/K.G. 6, from Arad, Deta (Romania) and Szeged (Hungary) airfields, escorted by 120 fighters, all six IK-3 fighters took off but one, Dusan Vujicic had to land due the cooling system malfunction. In that first combat, IK-3 pilots destroyed six German aircrafts with one slightly damaged (Vujicic), two badly damaged (Poljanec and Banfic) and one, totally destroyed and the pilot 2nd.Lt. Dusan Borcic was killed. First patrol Gogic/Semiz shot down one Ju-87, Captain Sava Poljanec from second patrol shot down one JU-87 and one BF-109 E, but his aircraft was hit and the engine began to vibrate. He made straight for Zemun airfield spraying glycol behind the tail and on landing. One Me-110 strafed his IK-3. One cannon shell exploded behind his seat, but wounded Poljanec landed safely. Third patrol, Borcic/Banfic shot down one DO-17 and one Bf 109E (Borcic) and probably one Me-110 (Banfic) In that continuing struggle over the Belgrade, Dusan Borcic was killed and Eduard Banfic was wounded and with seriously damaged IK-3 crash landed near the Zemun airfield. During the three more waves, each of about 100 German bombers (10,00; 14,00; 16,00 hours), pilots Gogic, Semiz, Vujicic took of three times and Captain Todor Gogic claimed one HE-111 shot down. On the first day of war, April 6th IK-3 pilots averaged three or four sorties and flyable IK-3 planes took off six to eight times. Yugoslav IK-3 pilots shot down 14 Luftwaffe planes during six days of war, in return for three damaged and one lost IK-3. This was the end of short but glorious combat history of IK-2 and IK-3.